95 cars filled the Tempe stadium by early Friday evening. Another great selection, with a few wonderfully idiosyncratic inclusions to help celebrate the 25th anniversary of Copperstate 1000. As we caught up with friends, and watched the sun go down across third base, the general consensus was this could only be another fantastic event. An early start today, thanks in equal part to excitement and sun creeping through window blinds I’d forgotten to close properly. The stadium car park was equally full of interesting cars, as this event has become a great reason for all the local gear heads and enthusiasts to bring their own vehicles out for inspection. Hot rods, muscle cars, genteel vintage and tricked out modern all played happily together as mutual appreciation conversations surrounded them. At midday, we had the first drivers meeting; and within 30 minutes all engines were running & cars began their slow procession towards the starting flags. Although the run was shorter than usual, the organizers ensured that what we lacked in mileage would be more then made up for in variety of scenery & ideal highways. Within ten minutes we were heading away from Phoenix and out towards long sweeping bends that would take us into the Ponderosa. The Egg was more than happy to keep up with her larger engined companions, however our joint enthusiasm was slightly dampened as I noticed the temperature gauge needle climbing a little too close to the redline for comfort. As she runs so smoothly now, it’s become almost impossible to remember that she’s a middle aged lady, and there’s always a little more acceleration available it seems! However, dropping back to a slower speed, and letting her coast down the hills as we enjoyed the quickly changing scenery soon resolved the problem. Unfortunately not everyone was quite so lucky, and we saluted a few other vehicles on the side of the road as we cruised along. I continue to be surprised by how quickly the environment changes in this small state, and today’s journey was no exception. Sandstone oranges and reds soon replaced with gorgeous shades of green and purple as we headed to higher altitudes, and through little towns like Peyson & Strawberry. This was ranch land, as proven by some really impressive log cabins, and long dirt roads that seemed to lead nowhere! Playing chase and be chased by a variety of other entrants, we both agreed the high spot of the journey was sitting behind a 1932 Lincoln Boattail speedster. 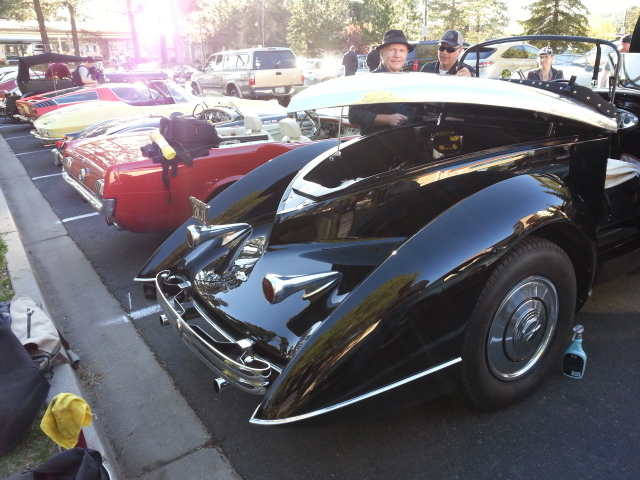 The car was immaculate, with gorgeous sweeping lines that shouted Art Deco at the top of their lungs. Chatting with the owner later in the afternoon, I discovered that the coachwork was new and had been done in the style of two renowned american custom builders, Hibbard and Darrin, who worked in Paris in the late 20’s and early 30’s. Not only was the restoration stylistically correct, all materials used were correct for the period. It really is a piece of industrial art. As the temperature continued to slowly drop, The Egg’s mood was unmistakably exuberant. 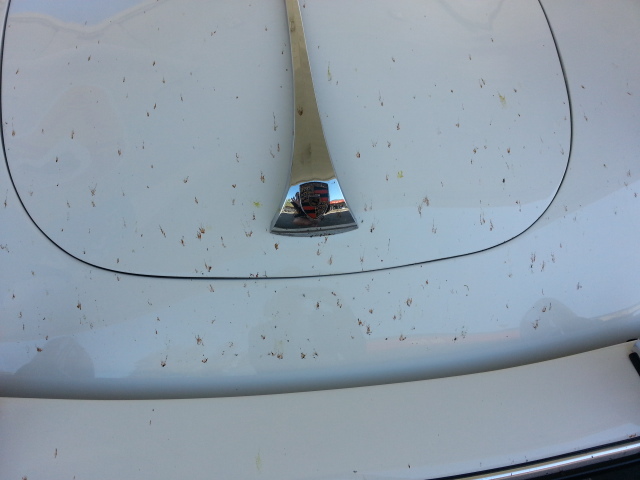 This is her type of driving conditions, and we were rewarded with smooth handling at every corner and a final bug count on the bonnet, that easily ran into triple digits. By the time we arrived at our final destination in Flagstaff, it was a case of follow the sunlight to ensure the remaining not so warm temperatures could be appreciated. Swapping stories, I was given a simple but worthwhile tip regarding engine temperature. If you’re concerned, rather than reading the gauge, stop and see how long you can hold the dipstick. More than 3 seconds, nothing to worry about. Hopefully I won’t need to test the theory tomorrow, but it’s good to know! With The Egg happily packed in its carton and heading to AZ by yesterday lunchtime, I didn’t have much reason to update my blog before kick-off. Until, that is, hapless cousin arrived; and bought with him yet more internet gold. Returning home last night I found his trousers on the driveway, iPad on the deck and an otherwise quiet house. Confused, I checked the garden shed (usual location for most lost Englishmen), but still no luck. As I reached for my cellphone, he bumbled into the kitchen, munching his way through a bag of crisps (US translation: chips) and proceeded to share his woeful tale of a lost iPhone. However, before you hit the “oh no” button, dear reader; I have to mention this is actually a replay of a conversation we had when he visited a couple of years ago. My perfectly pre-ordered super shuttle picked him up and deposited him to the final destination. Unfortunately, the excitement to actually experience sunshine first hand was so great, he didn’t notice his phone sitting on the seat as he climbed out. Desperate to change into shorts and a dubious ensemble of purple socks and checked shirt (clearly doesn’t pay any attention to the Instagram reposts of great menswear looks I share with the world), his entire focus was Vitamin D.
The only glimmer of hope on the horizon was Apple’s genius development of GPS & synching. Forlornly he stared at the iPad, now taunting him with confirmation said phone was sitting somewhere in Glendale, as I called customer service to explain “our” predicament. One extremely helpful lady, later, and we had reassurance they’d do everything possible to reach the driver and make arrangements for a later return. Jetlag provided Harry with an early morning start, and he was horrified to realise the phone had managed a round trip to both Burbank and LAX airport before 6:30am. With a quick nod of thanks to Apple, he used another apparently useful feature and made the thing start beeping as loudly as possible. Which is why my morning started at 6:37am, with a call from a complete stranger, informing me had my phone. An interesting statement as I’d grumpily answered the thing 5 seconds earlier until he explained there was a message flashing to inform it was lost and who to contact. 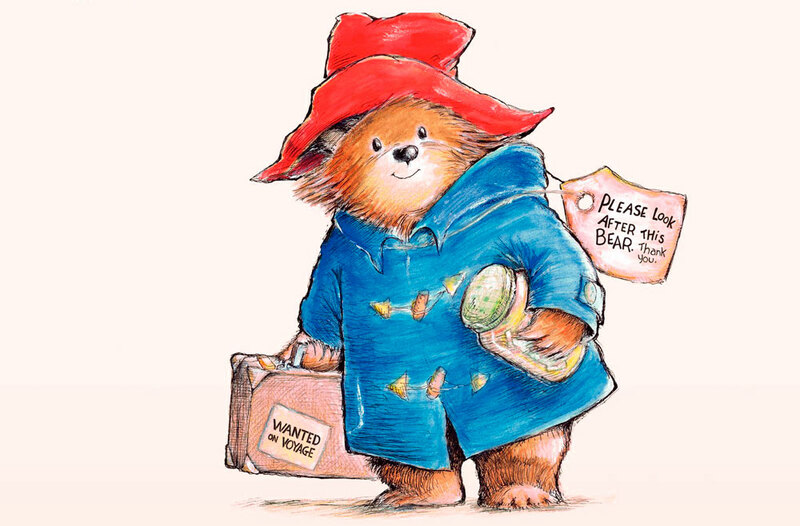 An electronic version of Paddington’s label, really. The Rally Gods were fortunately smiling on us as man, phone and super shuttle were literally (if the iPad GPS was to be trusted) now less than a mile away en route to their next pick-up before heading back to LAX. I reassured the very nice voice at the end of my phone, we could be wherever they were in under 4 minutes, if only they would wait. Which is why by 6:45am, I was driving through my neighbourhood in my PJ’s. In no mood for red lights before my first coffee, I opted for a couple of quick U-turns and reached our destination with almost 30 seconds to spare. Back home, coffee in progress, and dearest cousin Harry mentions he’d travelled to Atlanta in February, and had managed to do the exact same thing AGAIN before returning to London. …..Remind me again, what would we do without family?!! Sometimes we need more than a moral compass! I collected The Egg from my wonderful mechanic, Ed “The Egg Doctor” Rutherford at Klasse 356 a couple of weeks ago, and we flew home. A full bill of health for the safety inspection, and some tightening of the throttle has given her more pick-up, and even better; it’s instant. The car will happily cruise at 80mph (apparently), but the first few seconds from standing were always a little lackadaisical. It felt as if she was considering, rather than committing to, the idea of forward motion. Not any more….now, it’s literally pedal to the metal and catch me if you can!! So, with little left to do but wash, polish and give my tool kit a quick re-stock; I’m happily counting the days. 2014 was a good year to be driving in Los Angeles. Which may sound like an oxymoron, especially if you’re familiar with the 405, but thanks to Petrolicious (www.petrolicious.com), we had a couple of fantastic excursions around and out of the city. I supplied the car, my good friend Kelly provided the invitation and navigation for the first event “Drive Tastefully: Malibu rally”….which started at a strip mall on the back side of Pacific Palisades, and gave early morning coffee drinkers something far more interesting than a croissant to enjoy with their beverages. An eclectic mix of cars, that included Ferraris, Alfas, Porsches and even a late 80’s Countach. After a gorgeous morning investigating the canyons, we found ourselves at the Malibu Family wines vineyard for a relaxing brunch. The route had been exciting enough to ensure everyone was hungry, but even better – a chance to hang out with fellow Angelenos and talk about driving in a way that didn’t remind me of an SNL skit. The best part? 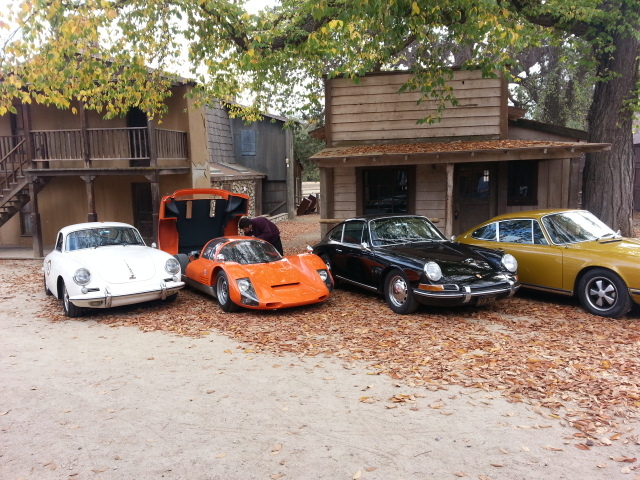 It was a chance to meet and thank the team behind Petrolicious. In a relatively short time, they’ve become one of the most interesting and innovative web magazines focused on cars. Clearly everyone involved is an enthusiast, and they bring that attitude with them to all aspects of their organization. A few months later, and their second event. This time, “Drive Tastefully: Paramount Ranch”. Another early start, however I was to be travelling solo due to the fact I couldn’t beg, coerce or bribe any of the usual local suspects to meet me so early on a cool October morning. Their loss!! A crisp start to the day, heading off to Malibu Outpost by way of the 101 & then cross country through the canyons. I found myself following a fabulous 2CV for part of the journey and was even happier to find it in the car park as I wandered around with my coffee. After a few catch up conversations it was time to review our driving instructions and then off to Ojai. I quickly realized there a some key issues of driving without a navigator, especially when you have a gearstick and nowhere to easily stick the instructions for ease of reference. Fortunately I know the Malibu canyon roads reasonably well, so only a cursory glance back to the paperwork seemed necessary….until I found myself heading back down towards the ocean and not inwards as intended. Pulling up to the side of the “reasonably quiet as it’s still early on a Sunday” PCH, I pulled out my phone and reviewed the instructions again. With no reception in the car, I looked into my rear view mirror before opening the door, only to find a number of cars (and drivers holding their phones forlornly to the sky) parked behind me. Apparently the directions were easier to misunderstand, and none of the available mobile carriers offer any coverage down by the sea! We all compared notes, and realised that whatever collective mistake we’d made could be rectified by heading back the way we’d come until the first turning opportunity presented itself. I opted to position myself in the middle of this group, as I was the only solo driver and wanted to take full advantage of someone else’s navigator this time! Meandering, wandering, cornering and throwing our way around the hills of Malibu and then on towards Moorpark and then further on towards Ojai. It was a perfect day to drive and even better, I found myself back on the route I’d taken the previous summer for a short getaway to Santa Barbara. Route 118 took us through agricultural land, beautiful scenery, and the perfect driving section of road known as Grimes Canyon. Twists and turns, plus the gorgeous colours of sandstone accompanied our merry band of travelers, and then finally we came into Santa Paula. At this point our now successful navigation turned into an episode of wacky races. Despite all of us having the same directions, there were at least four different interpretations of which way we should be going, again. Cars headed north, south, east and west along the two main streets for a while, until the popular vote agreed on a direction and we found ourselves back en route to Ojai. Reaching our final destination for the first part of the event, we all pulled into or around a garage forecourt. Petrol pumps worked overtime as conversations and cameras surrounded an extraordinarily stunning orange Porsche 906. From Ojai we were to head back towards LA, ending at Paramount Ranch, & I decided the best way to continue the journey would be to follow the orange beastie for as long as my much smaller engine would allow. Fortunately the first couple of miles were through the town, so my acceleration requirements were limited; but no sooner did we reach the open road again and VROOM, in a throaty explosion of horsepower, it disappeared. Sixty happy miles later, I pulled into Paramount Ranch. In the late twenties, Paramount Pictures purchased 2,400 acres for use as a “movie ranch”, and it’s been featured in numerous well known and not so well known Westerns. After World War II the studio sold the property off as parcels to private investors. In 1952 Bill Hertz bought 326 acres that still bear the Paramount name, and turned it into a western town. Open to the public, and available for various events, it’s also a great reminder of our California cowboy history. There were cars everywhere! A cornucopia of colour, carburetors and marques parked in every available space, providing a great juxtaposition to an environment that would have happily provided home to a very different kind of horses. After lunch (the perfect combination of carbs and more carbs – all that’s needed to refuel the internal engine), the cars were reorganized into a combination of years and marques, for more great photographs to be taken and everyone to agree it was another fabulous day.